So today we are doing some baking and my hubby decides to run a few errands for me. 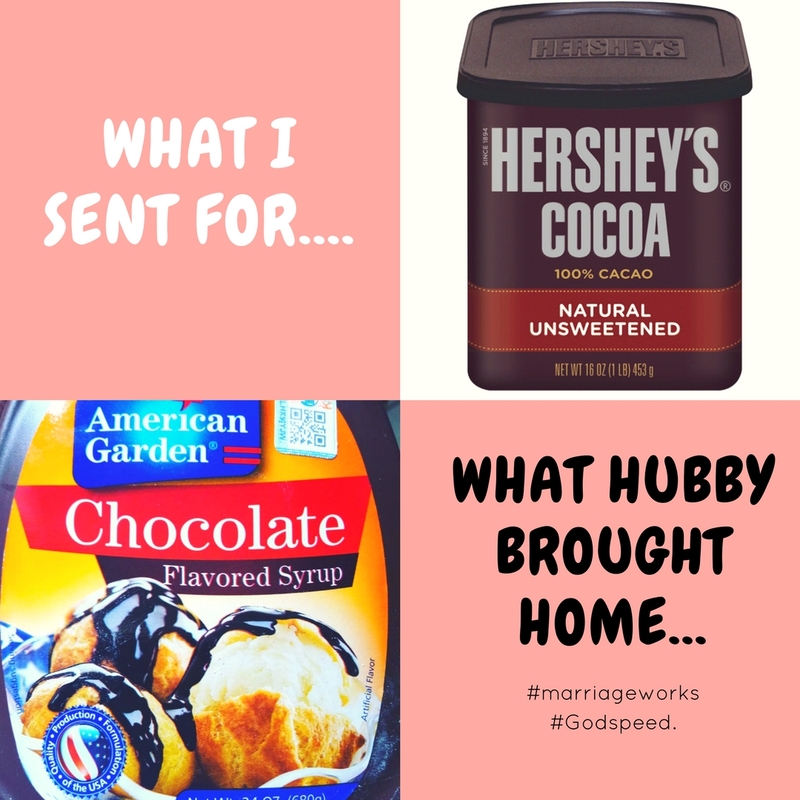 Well, he sees the below picture, and vulaaa… There is the UNSWEETENED COCOA POWDER! He buys it and comes back home. This has cracked me up! I have laughed so hard that he ended up laughing too…How does this read COCOA POWDER? Well, I know there are some couples who have made an issue out of something like this. Enjoy the moment instead of being all grumpy! No bone has been broken! Laugh about it, but most of all, PAT HIM ON THE BACK FOR THE EFFORT! Yes SAY THANK YOU LOVE! He ran that errand for you! It’s not USUAL. NOTHING IN MARRIAGE SHOULD BE TAKEN CASUALLY. Learn to say Thank you even to your spouse. It’s so easy serving others, loving others and sacrificing for others at the expense of your spouse. Put each other BEFORE ANYONE OR ANYTHING ELSE. Do not limit your “Thank yous’ ” to grand gestures! Do not be so rigid in marriage that you miss unique opportunities to freely love, give and laugh. Otherwise if you keep holding up THE EXPECTATIONS CARD, chances are your marriage will work more on mechanical efficiency, than intimacy – a pure travesty of what an abundant marriage should be. Thank you hunnie! You are the best 😘! Remember to VOTE FOR US! God bless you and share! Next PostA MARRIAGE FOR HIS GLORY. Where has this blog been all my life?? Landed here from the BakeAwards page and I am hooked already! God bless you Grace! Thank you and keep being blessed!